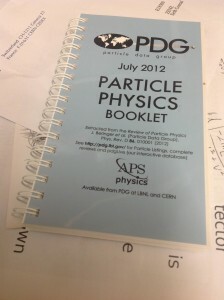 Last week, I got my copy of the 2012 Particle Data Group Review of Particle Physics booklet — which, along with its heavy, 1000-page full-length counterpart, we simply call “the PDG.” My very first copy, during my first months at CERN in the summer of 2003, is a vivid memory for me. Here was a book with almost everything you want to know, about every particle ever discovered! It was like the book of dinosaurs I had when I was a kid, and I read it in exactly the same way: flipping to a random page and reading a few facts about, say, the charged kaon. My new copy of the PDG has inspired me to adapt this fun for non-experts. So each day, I’ll feature a new particle on Twitter; I’m @sethzenz, and the hashtag will be #ParticleOfTheDay. Since starting last week, I’ve featured the B0s meson, the pion, the kaon, the electron, and the Higgs. How long can I keep this up? That is, how many particles are there? Well, that depends on how you count. The Standard Model has 3 charged leptons, 3 neutrinos, 6 quarks, the photon, and the W, Z, and Higgs bosons. But then there’s all the antiparticles. Dark matter candidates. The graviton. I could even argue for taking 8 days covering all the gluon colors! (Don’t worry, I won’t.) But most of all, there’s all the composite particles — those that are made from a combination of quarks. There are a very large number of those, and there will always be more to find too, because you can always add more energy to the same combination of quarks. The point isn’t to be systematic. I might go back and be more specific. I might repeat. What I really want to do is find a particle each day that’s in the news or I can say something interesting about. Flipping at random through a book of particles turns out not to be the best way to learn particle physics; ultimately, I needed to learn the principles by which those particles are organized. But it is an interesting way to tell the story of particle physics: its history and how it’s done today. After all, the particles do come out of accelerators in a random jumble; it’s our job to organize them. Have an idea for the Particle of the Day, and what to say about it? Let me know! For those of you who enjoyed my fascinating discussion of the 2008 Review of Particle Physics, you will be happy to know that the small-booklet summary of the review has now arrived. Remember that this used to be known as the “wallet card,” because you could in fact fold it up and fit it into your wallet. The current version is nearly 300 pages, so that would be a little more difficult now. The big question for me, then, is what will become of the “Pocket Diary for Physicists” (right), which serves as a calendar (including birth dates of all-time great physicists) and telephone index. It’s the same size as the old booklet, making it possible to fit them both into a little plastic cover that the PDG provided (also shown in photo). Will that get larger too? Will there be new plastic covers? I know, pressing questions that will affect the fate of the universe. But look, it was either write about that or about getting ready to teach one of the big sections of introductory electricity and magnetism starting tomorrow. You might be getting an earful about that from me for the next four months.